Abu Zubaydah’s testimony comes from the leaked ICRC report on the 14 “high-value detainees” who arrived in Guantánamo in September 2006, which was published last April by the New York Review of Books (PDF), and I’m posting it here because it complements the main themes of my article: that torture cannot be redefined, that what took place was demonstrably torture, that John Yoo deliberately ignored evidence that contradicted his agenda, and that hundreds of prisoners — both in Guantánamo and secret prisons — were subjected to some variation on the “enhanced interrogation techniques” that were approved for use on Abu Zubaydah in the “torture memos” written and approved by Yoo and Bybee. 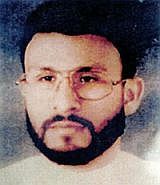 I also believe that it’s clear from the chronology established by Abu Zubaydah that his torture began long before the memos were issued on August 1, 2002, through prolonged sleep deprivation if nothing else, and would like to point out that, during this period, approval for the techniques used on him had to be personally approved at the highest levels of the administration. I woke up, naked, strapped to a bed, in a very white room. The room measured approximately 4m x 4m. The room had three solid walls, with the fourth wall consisting of metal bars separating it from a larger room. I am not sure how long I remained in the bed. After some time, I think it was several days, but can’t remember exactly, I was transferred to a chair where I was kept, shackled by hands and feet for what I think was the next 2 to 3 weeks. During this time I developed blisters on the underside of my legs due to the constant sitting. I was only allowed to get up from the chair to go the toilet, which consisted of a bucket. Water for cleaning myself was provided in a plastic bottle. After about two or three weeks I began to receive food, rice, to eat on a daily basis. They gave it once a day. I could eat with my hand, but I was not allowed to wash. It was also around this time that I was allowed to lie on the floor. I remained naked and in shackles, but I could sleep a little. It went on like this for about another one and a half months. During the first few days a doctor came and gave me an injection. I was told it was an antibiotic. After about one and a half to two months I was examined by a female doctor who asked why I was still naked. My measurements were taken and the next day, I was provided with orange clothes to wear. This was followed, however, by more threats that worse was to follow. Indeed, the next day guards came in to my cell. They told me to stand up and raise my arms above my head. They then cut the clothes off of me so that I was again naked and put me back on the chair for several days. I tried to sleep on the chair, but was again kept awake by the guards spraying water in my face. When my interrogators had the impression that I was cooperating and providing the information they required, the clothes were given back to me. When they felt I was being less cooperative the clothes were again removed and I was put again on the chair. This was repeated several times. Eventually (I don’t remember after how long), I was allowed to have a mattress and was given a towel to use as a sheet to cover myself with while sleeping. I was allowed some tissue paper to use when going to toilet on the bucket. There then followed a period of about one month with no questioning. Then, about two and a half or three months after I arrived in this place, the interrogation began again, but with more intensity than before. Then the real torturing started. Two black wooden boxes were brought into the room outside my cell. One was tall, slightly higher than me and narrow. Measuring perhaps in area 1m x 0.75m and 2m in height. The other was shorter, perhaps only 1m in height. I was taken out of my cell and one of the interrogators wrapped a towel around my neck, they then used it to swing me around and smash me repeatedly against the hard walls of the room. I was also repeatedly slapped in the face…. I was then put into the tall black box for what I think was about one and a half to two hours. The box was totally black on the inside as well as the outside … They put a cloth or cover over the outside of the box to cut out the light and restrict my air supply. It was difficult to breathe. When I was let out of the box I saw that one of the walls of the room had been covered with plywood sheeting. From now on it was against this wall that I was then smashed with the towel around my neck. I think that the plywood was put there to provide some absorption of the impact of my body. The interrogators realized that smashing me against the hard wall would probably quickly result in physical injury. During these torture sessions many guards were present, plus two interrogators who did the actual beating, still asking questions, while the main interrogator left to return after the beating was over. After the beating I was then placed in the small box. They placed a cloth or cover over the box to cut out all light and restrict my air supply. As it was not high enough even to sit upright, I had to crouch down. It was very difficult because of my wounds. The stress on my legs held in this position meant my wounds both in the leg and stomach became very painful. I think this occurred about 3 months after my last operation. It was always cold in the room, but when the cover was placed over the box it made it hot and sweaty inside. The wound on my leg began to open and started to bleed. I don’t know how long I remained in the small box, I think I may have slept or maybe fainted. I was then placed again in the tall box. While I was inside the box loud music was played again and somebody kept banging repeatedly on the box from the outside. I tried to sit down on the floor, but because of the small space the bucket with urine tipped over and spilt over me. I remained in the box for several hours, maybe overnight. I was then taken out and again a towel was wrapped around my neck and I was smashed into the wall with the plywood covering and repeatedly slapped in the face by the same two interrogators as before. At the end of this period two women and a man came to interrogate me. I was still naked and, because of this, I refused to answer any questions. So they again repeatedly slapped me in the face and smashed me against the wall using the towel around my neck. The following day I was given a towel to wear around my waist, but I was still very cold. Then, little by little, things started to get better. I was again given rice to eat. Then my mattress was returned. I was allowed to clean my cell. The tall box was removed, but the short one remained in the room outside my cell, I think as a deliberate reminder as to what my interrogators were capable of. One week after the end of torture I was given a pair of green shorts and a top to wear. The food also improved with the addition of beans and fruit. I was provided with water and allowed to wash inside the cell. However, the loud noise continued throughout the nine months I spent in that place. I was never given any outdoor time. Note: Mark Danner’s article analyzing the ICRC report, published in the New York Review of Books on April 9, 2009, is available here. This entry was posted in All Posts News Politics and-or Videos, Dandelion Salad Featured Writers, Gitmo, Politics, Torture, Torture on Dandelion Salad and tagged Abu Zubaydah, Andy Worthington, Guantanamo Bay Torture, John Yoo-4th Amendment-Torture, torture memos, Worthington-Andy. Bookmark the permalink.